First thing I'd like to say was about a letter I probably sent to the wrong address on the many email addresses on this site. It was about the beta Luigi's Mansion stuff and a goof in the insturction manual, just want to know if you got that. Alright, on to other things. 1. )The person who was dressed up as Mario for that convention thing said he just realized that Mario wears red overalls and all that. You probably should have told him that Mario also had worn purple overalls in Mario is Missing. 3. )With that person going "ape" over how bad DKJB was missing a point. Rare made those charcters, so why should another company re-use someone elses characthers? David Dayton: 1.) I've only played the NES version of that game, and only once. I don't blame him for not knowing about the game. 3.) Nintendo can use anything created in the Rare DK games -- they just choose not to. I want online Super Smash Bros..
MEGAß¥TE: Yes, I want SSB Revolution. I bought the last two Nintendo consoles for SSB games. Lizard Dude: Excellent use of "ape". I want a Wario Ware for the Revolution that uses the ca-razy (supposedly) controller. David Dayton: I've been saying that for years. BUT NO ONE BELIEVES ME! It's a conspiracy, I tell you...Twiddles thumbs. Chupperson: That's because it isn't a word, it's just an "ey" sound. Lizard Dude: I knew we forgot to ask Martinet something. MEGAß¥TE: He probably would have given the same answer as he gave for the "Thank you so much for to playing my game" line query. LieutenantEagle reporting. First of all, I know you get this millions of times, but great website. Second, I was wondering, where did you get your information regarding the Mario characters' height, weight, and the like? Was this information mentioned in an early issue of Nintendo Power or some other official site, or is this just something you made up? Finally, your Mariopedia entry for Star Piece is incorrect. In Paper Mario, there is a total of 160 Star Pieces, not 120. David Dayton: Some of the Mario character information has actually been released -- generally via NCL's website. I seem to have a vague feeling that Wario World's manual had something like that for Wario, but I'm probably wrong. MEGAß¥TE: I have a pack of Nintendo cards from Nintendo of Europe that has height/weight information, but they don't make a whole lot of sense. Hey everyone, first let me say you guys have an amazing site that I've been going to for years. Sadly, I have read every little bit of Mario knowledge on your site, however I am still compelled by your news and mailbags (w00t! mailbags). With the release of Nintendo DS drawing ever so near, I am astonished to see all these new games coming out, and most of them implementing both screens well (I'm thinking back to the old Game and Watch days). However, this new game coming out with Princess Peach as the hero seems to make me laugh. David Dayton: Even if Super Princess Peach is a rehash, it's a potentially fun rehash. If it's a new Mario platformer, I'm quite open to it. Please come to the castle. I have baked a cake for you. Deezer: I'm on a diet. Lizard Dude: I don't think I can jump high enough to survive the adventure. Hi again! I don't know if you remember me. It's me Latias Dita, the girl who wrote about Phantasy Star last time. Hopefully this email won't be as annoying as the last one. I have some questions too, but not that many so don't worry. For starters, you know that glitch in SMW, the "Magic Mouth #2" one in Star World 4? It works in SMA2, but not in the same way. Instead of a deformed thing, the object Yoshi spits out, it's Mario/Luigi's head! If you're riding on Yoshi, you'll only see his hat! It's really freaky! Right now, I'm loving Paper Mario: The Thousand Year Door! In my opinion, it's the best Mario RPG to date! The music is not as good as the last one, but the story and characters are much improved upon. Also, there is finally a Yoshi partner! I wanted a Yoshi partner in the first PM, but instead there was a CheepCheep. I named the Yoshi Hoshi, it's Japanese for star and it rhymes with Yoshi! Oh, and I also think the crows in Twilight Town are cool! Now if I may ask: We're you people surprised that the Twilight Towns people are humans (or at least called themselves that)? Maybe they're some kind of human subspecies? Also, which Mario RPG are your favorites? The is going to sound very random and strange, but I may as well mention it. My sister can do a Toad's voice very well. She really sound like one! It's cool and when we do the voices for PM:TTYD, it makes the Toads more authentic sounding. Now for two random questions: Which Mario game do you think has the best music? I personally think it's SMW2! It's so cheery and catchy! Also, have any of you played Tales of Symphonia? Please tell me you have! I think it's the greatest RPG on the GCN (it's better than PM:TTYD I'm sorry to say)! Out of all the characters that deserve to be in the next SSB game, I think ToS characters should be in it. ToS is not a Nintendo exclusive anymore, but it would still be awesome to see Sheen or Lloyd battle Mario or Link SSB style. Well, I think I've pestered you enough for now. Until next time! David Dayton: More glitches to try out. Oh dear. I share your opinion of Paper Mario: Thousand Year Door, although I'm sure many folks might disagree with us. Sigh. Now my mind is drawing a blank, but weren't the Twilight Town people walking around with patches on their skin? That would seem to make them other than human. I thought they looked a little like rag dolls. You do voices for Toad? Hmm... feel free to record a promo for WTMK and e-mail us a link to it! Heheheh. I've played Tales of Symphonia, but I haven't finished it yet. I keep forgetting to go back to it... I'm somewhere on disc two. Deezer: Whatever they are, the Twilight Town people just plain CREEP ME OUT. Lizard Dude: Great Yoshi name! I am currently playing ToS (2 player) but got EXTREMELY annoyed when I "gave" the Spiritua Statue to someone but it stayed in my Items list. Call me weird, but something like that can really sour my taste for a game. Oh, I agree about the Yoshi's Island music! Chupperson: I think I agree that Yoshi's Island has the best Kondo music... although Super Mario Land and Super Mario RPG also have some of my favorite Mario music. Sapphira: The crows are awesome. Tough choice on the Mario RPGs, since I love all of them and enjoy certain unique things in each. SMRPG = plotline and all the twists; PM = the timeless Marioesque feel to the plot, places, characters, and music (I absolutely love the music from this game); M&L = the great humor and unique storyline; PM2 = the amazingly-well-developed plotline and characters (great storyline, to mention, as well), and the battle system. Best music? Paper Mario; Yoshi's Island has excellent music, too, as you said. So the other day i'm stuck babysitting my 3 year old sistler, and I got the idea to teach her how to play a video game so I didn't have to build the same "My Little Pony" puzzle for the 50th time this week. I busted out the old school Nintendo since it would be easier for her to learn on. I put in Mario Bros., and what do you know.... She sucked... But then, after about 30 minutes of 'patient' time learning, she finally got the hang of it, and actually beat the first world. This got me thinking, whos the youngest recorded player to beat Mario Bros., or any other Mario game for that matter? Sapphira: I think everyone is young here, compared to you, David. :P Anyway...uh...considering I only beat the game like 5 years ago...I don't think around age 14 would come anywhere near qualifiying. I don't think I even first played it 'til I was about 5. Ever since I got the game (I was like 7), I remember always being stuck on World 8 for YEARS. 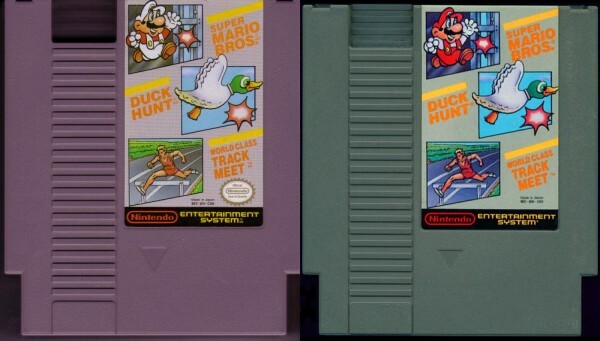 I have noticed that while my copy of the Super Mario Bros./Duck Hunt/World Class Track Meet cartridge has a label showing Mario in the correct fireflower colors, most of the other copies I've seen for sale have the same label, but with Mario's outfit reversed (white shirt and overalls, red hat and shirt). What's the story behind this? Is one less common than the other? David Dayton: I've always assumed the SMB/DH/WCTM carts were all the same... I have a few, and I've never noticed a difference. Okay, after some searching I've managed to find a Mario with white overalls on a Canadian cart, and Mario with red overalls on a USA cart. However, I'm fairly sure I've seen more white overalls cartridges, and it's unlikely that they're all Canadian. My guess is that Nintendo changed the level at some point during the years they produced the NES bundle. They've done it before -- I have at least three different versions of the SMB/DH cartridge. MEGAß¥TE: The red overalls cartridge came first (you can tell because the Seal of Quality is missing). I guess they noticed the label-game color discrepancy and changed it. Hello TMK, and all the Tasty Shrimps who hang around, i'd like to ask you,whoever is answering this time, a Pile of questions: 1) Could you even think about adding Custom/Ripped sprites Section to TMK? 2)I found a hammer from my closet one day. (I was about 5 then) There was a scribbling there and i wasn't very good reader. But now i found the hammer again when i was cleaning the basement, and i read the scribbling, i amazed. There was the following text: " Dear Super Mario, I wish you lots of luck beating Smithy! Yours truly: ~Ultra Hammer" How is that possible?! Who did it?! SMRPG wasn't even released in Europe! I'll send you a pic soon, Right now my camera is broke. 3) Which you prefer: Macaroni, or Spaghetti? 4) And last but not a half-burned potato: What would you take with you to a desert island? David Dayton: 1.) Aren't a good number of the "sprites" already in the Mariopedia? 2.) I suppose you might have written that before you tossed it into your closet. 3.) Spaghetti -- I make a somewhat decent garlic-tomato sauce. 4.) A satellite phone of sufficient strength so as to contact the nearest stable country's marine force. MEGAß¥TE: 1) Custom sprites? I thought about it. No. 3) Spaghetti. I'm partial to marinara sauce, so, yeah. Hello. The new Lost Bytes section is really nice, and I was wondering which SNES cheat device is recommended by the Mushroom Kingdom staff. Thanks for everything! Chupperson: No cheat devices are recommended by me unless you're trying out weird effects or getting things normally impossible to get. Lizard Dude: I like how David doesn't even answer the question. David Dayton: I sort of assumed the readers could connect the dots. peoples of TMK, it is i, the annoying sunbun. *1* - how can paper talk? or.. grunt? -2- - what do you eat for breakfast? .3. - why was i sent three nintendo customer service survey cards recently even though i didn't call them for anything? #4 - BRING BACK J.J.
(A bit later, Sunbun returns to tell us:) ...i don't know what to say this time, i asked you everything-- oh, except..BRING BACK MUSHROOM BOY! hmm... just for fun, i wanna see you guys answer this mailbag in spanish. heheh. David Dayton: It can't, it doesn't matter, for no reason, J.J. never really left, and Mushroom Boy is lurking behind the scenes -- and in #tmk. MEGAß¥TE: No. (That was Spanish). Lizard Dude: Just for fun, I wanna see you use proper capitalization. Sapphira: Tu cabeza es pequeña, y tú eres (sí, "eres," no "es") molesto. Oh, and I second Tipo del Lagarto on that. David Dayton: Now now -- we also have a tiny description of the game and a note about the Hemingway reference. Chupperson: Someday, I should put all my flawed, emulated screenshots on that page. David Dayton: Emulated? Are you implying that TMK supports the great evil that is emulation? Next thing you know, you'll imply that Gamespy and Classicgaming used to offer arcade ROMs for download. Hey, cool site you got here. I found out how many blocks Paper Mario 2 takes up on a memory card: 17. Can't wait to get that. Also, I don't have a picture, sorry to say, but another Mario-related item in Pikmin 2 is a set of matches with Bowser's head on 'em. Well, see ya later or something. David Dayton: I really thought we had a Pikmin 2 page with pictures of all the Mario references. Strangely, we don't. I'll have to go check and see if I still have my screenshots. Deezer: The 'byte is right. Lo There, first time writer Here. I am wondering about when you are going to add the data from the thousand year door to the mariopedia, I Myself know that there are many fans like myself want to see the thousand year door data. Not Rushing you though. Sapphira: I think the Mariopedia's being reformatted or something, so anything new added's pretty much on hold. Not 100% sure, though. Deezer: I want to get the Mariopedia databased eventually, so I don't want to spend a great deal of time on its current state. new secret in forest fortress -- get the feather from the last ? box then bypass the first red door. get a running start on the platform prior to the lava pit and instead of performing the standard caped mario flight, perform the spinning flight, mario will land on top of the erupting lavas and land on a ledge with another red door that is surrounded by boxes. every box contains a 1-up. David Dayton: Actually, that's not really a new "secret" -- that door has been known about for years. However, not very many people use the "spinning flying jump" move as much as they could. It's really great for zipping through large, open levels -- especially as the spin jump keeps you safe when landing. MEGAß¥TE: Do you seriously think you found a new secret in one of the most played games of all time after the game has been out for over 14 years? 2) What do you think of Mario Power Tennis? 3)What are your tips in Super Mario Sunshine regarding scrubbing Sirena Beach? 4) Same game, how do you get to corona mountain? 5) Do you need 120 shines in that game? Okay, okay, I'm done. Oh yeah, what's the mario reference in full house? I LOVE FULL HOUSE! I MUST SEE THAT EPISODE! 6a) In Paper Mario 2, Luigi is all like: "O, I love Eclair, my princess Eclair," and I was like "huh? Isn't Luigi with Daisy?" 6b) Did Daisy dump him? 6c) Is that why in Mario Power Tennis, during the Daisy award movie, Daisy roller bladed onto the stage, spinning Luigi around to grab her trophy, therefore maiming him? 7a) About that game, why is Mario such a sore loser that he steps on Luigi's toe during luigi award ceremony? 7b) What the heck do shy guys really look like? Are they scary-looking? 9)How long will this site be on the internet? Okay, I'm done. David Dayton: 2. It's better than Mario's Tennis for the Virtual Boy. 6. Once again, someone is making the mistake of expecting consistancy in the Mario universe. Presumably, Daisy is still Luigi's "girl" -- although whether or not that will be a plotline ever developed is another story entirely. 8. What's even weirder is that I'm responding to e-mails from January. 9. Until Deezer dies. Or gets married. Chupperson: Marriage wouldn't stop him, I reckon. And if he ends up dying, the legions of TMK followers will take up the mighty cause. Or something. Vacuum the masks off the ghost Shy Guys in Luigi's Mansion. I'm betting they look like that, since they do. Sapphira: 1) If a guide is what you need, that's what GameFAQs is for. 3-5) See last sentence above. 6a) It was probably just a passing crush. Besides, *SPOILER* Eclair ends up marrying someone else, so it doesn't matter anyway. 6b) Remember, it's only officially *rumored* that she MAY be Luigi's girl. 9) I don't think any of us would ALLOW the site to die. Besides, there are enough staff members to take over if Deez stops. TEAMWORK, BABY! Who is the character in Mario Party 3 who has a blue dice block on his head? this question has been killing me! who is he? i know he was the one who led the Mario characters into the Party World but I can't remember his name at all! please help me out! - London, a toad fan! Deezer: His name is Tumble. David Dayton: That's nearly as bad as the timer from Diddy Kong Racing. Deezer: Yeah, we know about it. MegaByte and I have posted in the VFD already. MEGAß¥TE: As we said in the VfD, we had nothing to do with this. Apparently some guys named Tigerz and Vadir on Wikipedia claimed there was some sort of lottery for #tmk mod status if people would spam TMK links onto Wikipedia. Such a contest was not held, sponsored, or endorsed by TMK, and appears to be some sort of smear campaign by the two individuals claiming to run our site. We have no idea how this got started or who these individuals are. First of all, we would never condone link spamming, and secondly, we only allow TMK staff and Fungi Forums mods to have op status. David Dayton: I didn't think we had any enemies. Deezer: Update: Looks like the VFD has closed. The funny thing is, it seems like most of the non-sockpuppet Wikipedia users who voted were on autopilot, voting without even visiting our site, because 1) TMK is not a "webforum" and 2) a quick visit to our IRC channel / message board would have revealed that the actual spammers didn't bother to use names of actual TMK staff/users. Kind of scary that these Wikipedia editors, a group of people concerned with total accuracy, did not do any research here. However, I would like to thank Jtkiefer and FCYTravis of #wikipedia for their help, patience, and understanding. You mean you're not grumpy with recent Mario games? You sure did fool me. Lizard Dude: I am not grumpy with recent Mario games. David Dayton: He is not grumpy with the recent Mario games. MEGAß¥TE: Nice use of nondescript pronouns. Hello again! Thanks so much for putting up my letter! (it was a while ago ;D) Y'know, would that last sentence have sounded better with "publishing my letter" or would that totally not be appropriate for the situation at hand? What? Stop staring! Well, we had some discussions on some of my favorite games in the last mailbag, so I of course had to put in some random garbage (this letter). Do you all think Paper Mario 1 or Paper Mario 2 was the better of the two? I personally fell for the first game because, well... Lady Bow for one thing. I love here crazy laugh (shame on Nintendo for not including that animation in the second game! :D) I felt that Paper Mario 2's ending lacked the satisfaction of the first game's ending. I will admit that the final boss battle was perhaps better... but Peach's role was so much better in the first. I'm all for the gal kicking some serious boot-ay with Reggie, so I was kinda dissappointed. Peach's role has been seriously declining in the RPGs, have you noticed? Super Mario RPG: Party member. Kicked Goomba with FRYING PAN!!!! PWNED! Paper Mario 1: Sabotaged Bowser's plots, then turned around the final battle. Mario & Luigi 2: Voice stolen, does nothing really. Paper Mario 2: The information she leaks out is mostly unnessesary thanks to the "Magic Map", then... well... I won't spoil it! Okay, so we are slightly improving but still. Finally, what is your take on the more... edgy? shall we say? style of Super Mario Strikers? I personally feel that it might be a mistake to mess with Mario's clothes as much as they did, but it really doesn't matter. You guys were at E3, playing the game, I think, right? Did Charles Martinet give his voice? In the gameplay footage we got this soft growl things from Mario when he was scoring a goal. Too early to tell I'll bet. Well, thanks for reading this far! P.S. I named my Nintendo DS "Denis"! SMRPG's ending gave me infinitely more satisfaction than Paper Mario's. David Dayton: I think I liked PM:TTYD more than the first one, but I'm not entirely sure. I will admit that Super Mario RPG had the best ending -- even if it was entirely stolen from Disneyland's Main Street Electrical Parade. Deezer: Grumpy is not with the recent Mario games. Chupperson: Did David ever watch Paper Mario's ending? Sapphira: I honestly don't know which Paper Mario I like better. Both have unique characteristics that I love, and both seem to lack something the other has. Both are excellent and two of my all-time favorite games (as is SMRPG). I liked how Peach helped in PM's final battle. In PM2, it seemed like she did more risky things, so I don't see how you could say that. I was only disappointed with her role in M&L. PM's music and ending were definitely better (at least the credits part of the ending), but PM2 had a really great climax. That's just one example/comparison; there's a lot more I could list. I don't know, I really can't pick which one I like better; both are excellent. Hello TMKers. Didn't think you'd hear from me again after my so-called "tidbit" on Super Mario World back in '03, eh? Well, after some searching with a friend of mine, we noticed you didn't make mention of another potential Mario release on the CD-I, which was later canned. We thought we'd fill you in on it, in case you weren't already aware. A sequel to the 1991 hit, Super Mario World, was in development for the SNES disk drive, but when Sony left Nintendo's R&D team, the company Phillips joined in for the fun. Phillips then took over R&D research and remade the title tenitively called "Mario's Wacky Worlds" and slated it for a release for the CD-I. Three prototypes of the game exist, one that was sold on Ebay for $1000. Even though this tidbit of info has existed for years, and there is a hardy handful of screenshots from the game, I still find it odd that TMK, the biggest Mario resource on the web, fails to even slightly mention anything about it. Unless of course, the information for this title wasn't posted on the site because of it being cancelled. Canned or not, CD-I or not, I believe this game is at least worthy of some mention on the site. What do you think? MEGAß¥TE: We've mentioned it in two places. It's featured in the Lost Bytes section, though we haven't put up screenshots there yet. It was also featured in a previous mailbag, with screenshots included. Disc images of the prototype are available, so we will eventually post more screenshots and other info. David Dayton: We should add some more Hotel Mario information at some point, too. hello, do you know were can I get tabs or music sheets for SMB themes? David Dayton: Too bad Pato didn't want guitar tablatures. MEGAß¥TE: Deezer, you forgot to promote your own site. Check here for tabs: http://videogamejam.com/. Also, try here for sheet music: http://members.home.nl/nintendosheetmusic/sheetmusic.htm. Hello. You see, I recently downloaded some pictures from your image archive. They are titled Red Fire, Wario Car, Turbo Yoshi, Koopa Dasher, Koopa King, Heart Coach, Goo-goo Buggy and the DK Jumbo from the Mario Kart: Double Dash section. I had added vehicle's stats from the game but with numbers not stars (I hope you don't mind). I decided to post these on the website www.deviantart.com, but were taken out because I forgot to ask permission. So now I am asking, may I use you pictures and of course if you want me to provide a link to your site, I have to. Whether you let more or not that's alright. Thank you for your time. Deezer: I suppose that's ok. Just link us giving credit, please. Now, it says there that they have made a partnership with them, why havent you mentioned them OR the Anime info they have? The only thing I see is the Ice Capades that Koopaprince gave you. Deezer: Check the July 13th update. The anime info is next on my list. David Dayton: THEN we can tackle the Capcom redemption arcade machines! Viola. Sory but the resolution is awful because they are digital pictures of regular pictures. If I ever get my scanner fixed I'll send you some better ones. The first one is of me under the stairs. The third one is of the 2 bottles of water they gave away. And the fourth one is of the hat I bought with the free pins attached. David Dayton: Send free stuff to me, and I'll give you all the Animal Crossing NES games.